Microsoft launched their much-hyped WorldWide Telescope this morning. 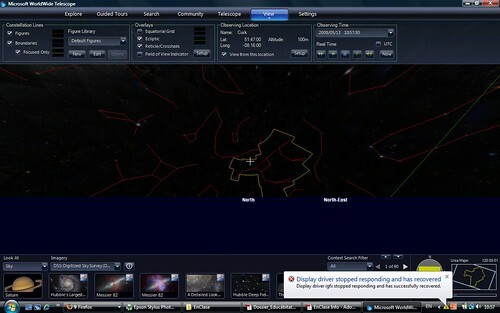 The application has a lot of promise as an educational tool, in that it can make astronomy fun and engaging. First off, there is no Mac version. Boo! For this reason alone, I should have just walked away. But I didn’t because it promised so much and I quite enjoy astronomy. I checked out the system requirements (bearing in mind how optimistic Microsoft are on these typically – did you ever try to run XP on 64mb RAM? Ha!). 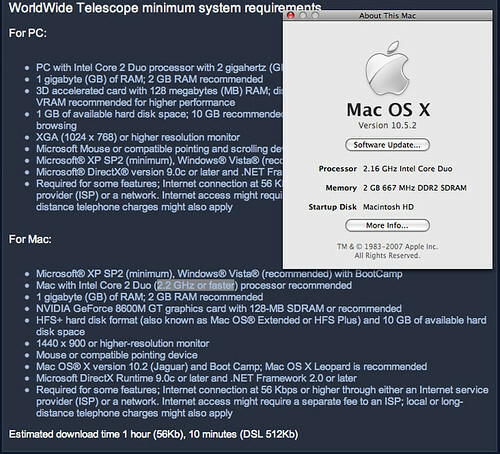 On the System Requirements page it told me I needed a 2.2GHz Mac to run WorldWide Telescope if I wanted to do so on XP or Vista (recommended) via Bootcamp (no mention of Parallels or VMWare. Given that my Mac is 2.16 GHz, and hasn’t BootCamp setup (I use Parallels), I gave up on that option. I then went about installing it on my Vaio. The installation went ok (although I wasn’t made aware until half-way through that I’d have to install Direct X). When I launched it on the Viao though, the first obvious problem was that you can’t choose Ireland as an option to set as your location. What a crock! Seriously. The country options go Iran, Iraq, Israel, Italy. WTF? People in countries like Yemen, Uzbekistan, Lomé, Togo, Sierra Leone, Senegal, North Korea and Myanmar, for instance have no problem setting their location. But no Ireland option. What did we do to annoy Microsoft Research? The second issue was even more annoying though. The application wouldn’t run on the Vaio. It crashed the display driver. This is, unfortunately, typical Microsoft software behaviour. Launch bloated, Windows only, error-prone software with the minimum of QA or testing. Let the unsuspecting public be your free testing department and hopefully get the software right by the third revision. It is no wonder so many people are afraid of computers when the software released by the world’s largest manufacturer is so prone to crash.